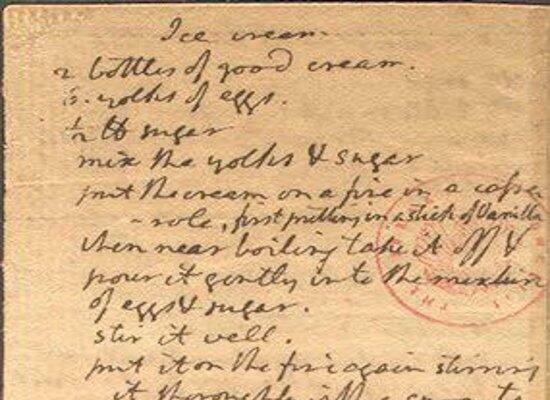 Another thing you can credit Thomas Jefferson with -- being the first known American to record an ice cream recipe. It's one of 10 surviving recipes written by the founding father. According to Monticello.org, ice cream began appearing "in French cookbooks starting in the late 17th century, and in English-language cookbooks in the early 18th century." And there "are accounts of ice cream being served in the American colonies as early as 1744." Jefferson likely tasted his fair share of the dessert while living in France (1784-1789), and it would continue to be served at Monticello upon his return. By the first decade of the 19th century, ice cream would become increasingly found in cookbooks published throughout the U.S.
You can see the entire recipe for Jefferson's vanilla ice cream recipe here, and a read transcript below. put it on the fire again stirring it thoroughly with a spoon to prevent it's sticking to the casserole. when near boiling take it off and strain it thro' a towel.